Orioles don't need written instructions for building their summer homes, even though they construct one of the most complicated nests in North America. They follow the "nest-building blueprints" in their brains, and instinctively know how to build the perfect structure to hold the eggs they're about to lay. Have you ever noticed that orioles' nests are always alike? But have you ever seen an oriole teaching another how to build a nest? Imagine you are an oriole. You can make a nest for yourself if you follow the instructions below. It's a lot of work! Fortunately, after your babies fledge, you're all done needing a crib for a whole year. Next year when you build another nest, pieces of this one might still be hanging in the same spot. Then you can tear them apart to use the best fibers all over again. Remember: Reduce, reuse, and recycle! A. Locate a good branch in the right habitat. A tree along a lake or stream, or on the edge of a woods is perfect, but you can pick a suburban area or a park if there are lots of shade trees and a source of water nearby. You want your nest high up near the tip of a limb, where the branch is too slim to support squirrels and crows, so you have to pick a tree that has long, strong, narrow twigs. The American elm is the very best choice, but there aren't as many of those as there used to be. Silver maple, apple, sycamore, cottonwood, willow, birch, and other species work, too. B. The nest is usually near the outside of the tree, but in the Great Plains, where the wind is often very strong and there are fewer squirrels, the nest is often nearer the trunk. Usually oriole nests are fairly high. They average more than 10 meters high, but there's at least one record of a nest only 1.2 meters high. Some orioles prefer to build their nest on the leeward side of a tree (out of the wind), but some orioles don't seem to care which side the nest is on. C. Wherever you build your oriole nest, pick a sturdy branch. You don't want it to fall or blow off! Remember, you and your eggs and babies will be stuck deep inside your purse-shaped nest for the next 5 weeks, so be careful to pick a spot that's safe, cool, and comfortable. Your nest is going to dangle from the branch, so we sure hope you don't get motion sickness! A. Long fibers. This includes grasses, hairs from horse tails and other long animal fibers, string, yarn, thread, or thin twigs. B Springy fibers. Milkweed stems and grapevine bark are examples. A. You will carry one fiber at a time to the nest. 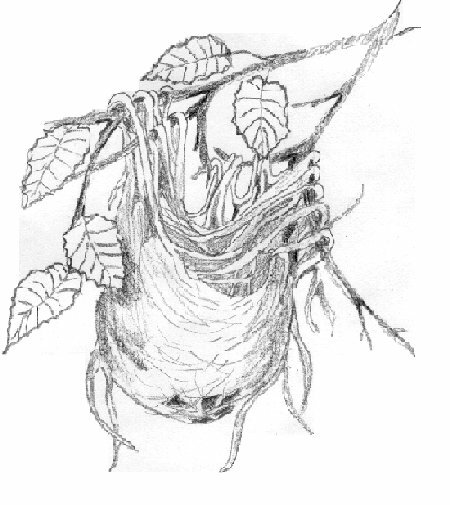 Hang onto the nest twig with your feet as you wind the first long strand around the twig loosely with one or more turns. Bring the next fiber to the branch and wind it around the twig weaving it around the first fiber. Keep adding fibers and weave and tie knots in them until in 2 or 3 days you have a tangled mass of fibers hanging from three or four places on the twig. This snarl of fibers will become one side of the nest. B. 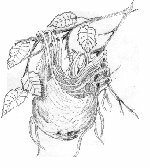 Now, while clinging to the side of the tangle that you want to serve as the inside wall of the nest, start weaving in fibers and twigs to form the nest's skeleton, and weave in more and more fibers to fill it out. As it starts to get round, sit inside it and shake your tummy on the bottom and sides to shape it. If you happen to have a human-being-sized tummy, you can use a tennis ball. Keep weaving and knotting fibers in until the nest feels very secure. It must safely hold you (you weigh about 30-40 grams) and 4 or 5 eggs (sometimes as many as 7!) which hatch into nestlings that start out weighing 2 grams . . .but balloon up to 34 grams by the time they fledge in 11 -14 days. C. All those babies wiggling about in one purse-shaped nest can make an interesting sight. Make sure you weave the nest tight enough that none of the babies fall out! And then line it with the softest, downiest fibers you can find to make it a snuggly baby crib. You've done a lot of work to make this wonderful nest, but after the babies leave, you better move out. Even the cleanest oriole family can't keep mites, lice and flies out, and once they get a head start, they can really multiply fast, making an old nest unsafe for a new batch of babies. Also, even the most wonderful weaving starts to unravel a bit with four or five baby orioles jumping and flapping their wings and learning how to use their claws to hang on things. And this nest doesn't come with a warranty. How might Dutch elm disease have affected orioles? 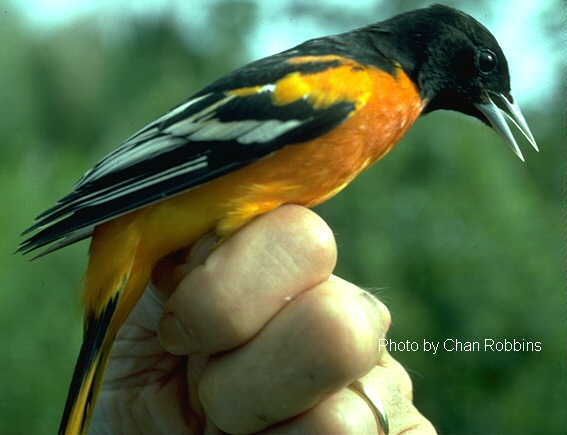 What other factors might affect or reduce oriole habitat? How can you help orioles? What's the total weight that must eventually be supported by your oriole's nest?